Years ago, as a new Christian, I was thrust into ministry quickly. At the time I didn’t understand surrender, so I tried to lead by my own power. I learned very quickly about God’s power being made perfect in my weakness (2 Corinthians 12:9). I got really good at making God’s power perfect! He used me even though I had no idea what I was doing most of the time. But I also made lots of mistakes. I was sharing my faith—or trying to—with one couple in our apartment building. I spent months using every tactic I had learned, and then some, with no results. Finally, my wife told me to back off. I couldn’t believe it. What a backslider, I thought. I was fulfilling the Great Commission, but I had married a heretic! Then she told me that perhaps I needed to leave room for the Holy Spirit to work in their lives. She was right, of course. I receded, and eventually the couple came to Christ—about a year after we moved from the building. In my ministry, I’ve been in lots of overwhelming situations. I’ve spoken on the phone with people talking about committing suicide. I’ve walked into hospital rooms of dying patients surrounded by family members in need of comfort. I’ve entered homes where men have died in their prime. In one case—and I wasn’t ready for this—the man’s body was still on the floor in the living room when I walked in. If I would have been faced with the same situations years ago, I may have done more damage than good by trying to minister in my own power. Over the years, however, I’ve learned more about surrender—yielding the situation completely to God. More and more I can respond as David did: “When I am overwhelmed, you alone know the way I should turn” (Psalm 142:3, NLT). God, you know I don’t have whatever’s needed to minister to this family. I don’t have the right words, and I’m not sure how to handle this. I’ve got nothing! But I know that you do have all the right words and you do know what is needed. So I’m once again surrendering myself to you. Use me any way you want. If they need words, speak the words through my voice. If they just need someone to be there, help me to be quiet and to be there with them through this. If they need counsel, give me the words to say at the right time. Whatever their need, God, you know what it is, so use me anyway you want. I’m all yours. I’m always amazed at what happens. God does his work, whether I understand it or not. There’s nothing magical or mystical about it, but I know God has used my weakness to demonstrate his power. One family sent me a card that thanked me for how I ministered to them through my caring attitude, my words, and even my humor. When I received the letter I chuckled because I went into the situation with no idea how to handle it. But God did. Humility—It all begins here. Surrender demands a humble heart. Jesus humbled himself when he “made himself nothing” and left heaven to become human (Philippians 2:7-8). Humility is the opposite of selfish ambition and vain conceit (v. 3). Authenticity—A humble person can be who he or she is without pretenses. Even though he was, by his very nature, God (v. 6), Jesus came and lived as a man (v. 8). He never denied either part of his identity. He knew who he was. Vulnerability—An authentic person can be open and honest with others; he has nothing to hide. Submission/Obedience—A surrendered heart means you are submissive to authority. Jesus obeyed his Father in everything, even death (v. 8). Integrity—All of these characteristics lead to integrity—uncompromising adherence to truth. Jesus was the model of integrity. He was the truth (John 14:6). Integrity elicits trust, a vital characteristic of a small group leader. Loving themThese are some of the attributes of an effective leader, but one more needs further discussion. God has called you to help bring about spiritual growth in people’s lives. But how does that happen, exactly? What’s your role? Imagine you are the captain of a sailboat. How do you make the vessel move forward toward your destination? The wind and only the wind supplies the power necessary for movement. If the wind is not blowing, you might as well forget raising the sails. How about having all the people on the boat blow as hard as they can into the sails? No, that won’t work either. No matter how much effort you expend—no matter how much you huff and puff—you cannot move the ship forward. You cannot create wind. So what do you do? You wait for the wind and then raise the sails to catch it. What happens if you do not raise the sails? Nothing. The power is accessible, but you must do your part in the partnership—raise the sails. The wind can only propel you forward when you are engaged in it. Sailing is a partnership between man and nature. Spiritual growth is a collaborative effort between you and God. You cannot do it without God. He has ordained not to do it without you. The term for Spirit is the same for that of wind in both the Old and New Testaments. The Holy Spirit is the wind that provides the driving force of all spiritual growth. You cannot bring about spiritual growth in your own life or the lives of those you lead. Pray for the members of your group. That’s your first and most important job. Be an example to the flock. Let them see spiritual growth happening in your own life by being involved in the spiritual disciples of worship, Bible reading, prayer, and others. Involve the group every week in practices such as meeting in authentic community, studying and applying God’s Word together, teaching and admonishing one another, praying together, serving together, and confessing your sins to each other. 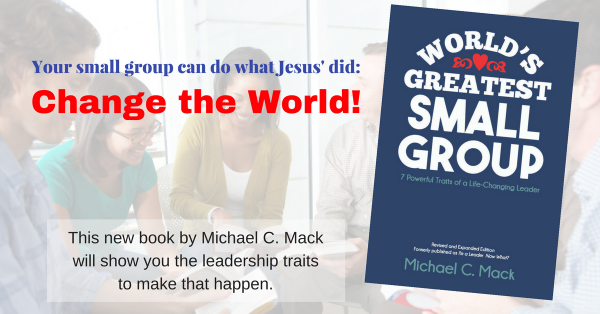 Shepherd your members outside of group meeting times. Be prepared to mentor them in areas where they need to grow, as God leads you. Get out of the way so God can get to work.